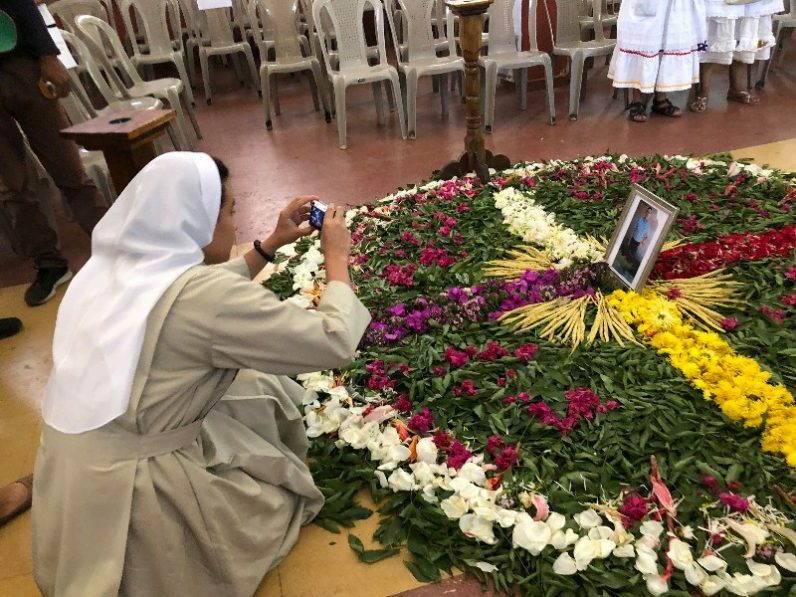 Officials held the April 1 funeral Mass for Father Walter Vasquez Jimenez, a priest of the Diocese of Santiago de Maria in eastern El Salvador, in his native Lolotique, a picturesque town with indigenous roots. Surrounded by the sounds of drums and marimbas, with a circle full of flower petals on the floor in front of the altar at Lolotique’s Holy Trinity Church, Father Vasquez’s casket was surrounded by his mother, friends, parishioners, the country’s only cardinal and four bishops. “He was headed to Mass, which he won’t celebrate now, but he will celebrate in the presence of God,” his cousin, Jose Diaz Vasquez, told Catholic News Service. He was one of the thousands packed into the town square in front of the church to remember the priest. Father Vasquez was headed to celebrate a Holy Thursday Mass in the department of San Miguel March 29, hours after renewing his vows as a priest at a chrism Mass, when a group of heavily armed men wearing masks stopped the car he and parishioners were traveling in. The passengers were robbed at gunpoint and the priest was fatally shot. “We condemn all the acts of violence that are committed daily against our people and that lead to homicides, such as the one committed against Father Walter Vasquez,” said a March 30 statement by Fathers Estefan Turcios Carpano and Luciano Ernesto Reyes Garcia, director and adjunct director for the Archdiocese of San Salvador’s human rights office, Tutela Legal de Derechos Humanos. The office demanded that authorities investigate, capture and prosecute those responsible for the murder of Father Vasquez, and those responsible for the general violence that El Salvador suffers. Father Turcios, who serves in Soyapango, a city near San Salvador that suffers from gang violence, said there is much that is not yet known in Father Vasquez’s case, but he has spoken in the past about unequal economic situations that have led to war and now to a culture of violence in El Salvador’s poor areas, such as the one where he serves. The Holy Week killing of Father Vasquez harkened memories for Father Turcios of the violence surrounding the 1977 killing of Jesuit Father Rutilio Grande, the first Catholic priest killed prior to the country’s civil war. And it did the same for some of Father Turcios’ parishioners, who initially worried about participating in outdoor religious activities during Holy Week following news of Father Vasquez’s killing. Salvadoran Cardinal Gregorio Rosa Chavez asked those gathered at the priest’s funeral to think about the killing. “What is it trying to say to us as a country?” he asked. San Salvador Archbishop Jose Luis Escobar Alas marched near the slain priest’s coffin, decorated on the top with a bouquet of purple flowers, as it was carried up to the church, while bands played and the crowd sang hymns and popular songs. Church officials such as Father Turcios and Archbishop Escobar blame a history of economic injustice in the country for its latest episode of large-scale violence manifested by gangs, a period that began shortly after the country’s 12-year civil war ended in 1992. A group from Father Vasquez’s St. Bonaventure Parish, in the department of Usulutan, where Father Vasquez last served, said they believed the crime was random, and he suffered as many others suffer in the country. Even in a country where tension exists between Catholics and some Protestants, Father Vasquez was a person respected by people from a variety of faiths, Aranda said. When the group showed up to the vigil wearing the shirts with his image, it represented their belief in the Resurrection, which includes now Father Vasquez’s, Perez said.